The One with the GOING PLACES Big Picture Classes Giveaway! I've got a giveaway today to a spot in the latest and greatest class from Big Picture Classes: GOING PLACES, sponsored by my sweet scrapbooking friend, Angie Gutshall! Four scrapbookers. Four very different vacations. Four mini albums that share their adventures in modern, memorable ways! 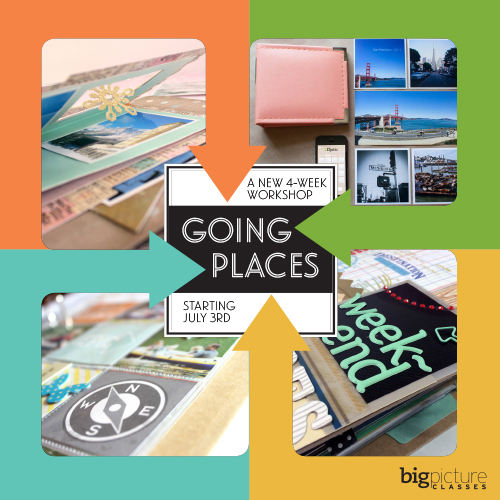 Pack up your pictures, patterned paper, and page protectors and join four talented instructors (Katrina Kennedy, Tami Morrison, Angie Gutshall, and Kim Jeffress) on this 4-week scrapbooking journey! Whether you're traveling across the globe, close to home, or not at all this year, Going Places will help you document your most treasured vacation memories. What a fun class! We will be "staycationing" with little getaways to Chicago (which is just 30 miles away). We went on a big trip over Spring Break, so it'll be fun to do some different things in our "hometown" this summer! Thanks so much for the chance to win a spot! what an awesome class! We'll be moving into our new place and hopefully traveling back home to visit family. Thanks to the military it's been 8 years since the entire family has been together and my BIL is coming back for the summer! I´ll have to work while the others are away - that´s it when you don´t have children. But my time is in September - I´m going to the North Sea. Not warm enough for swimming anymore but still warm enough for relaxing in a "Strandkorb". What a great class idea! My summer plans include going to the pool a lot and maybe a road trip to the zoo or an amusement park. We are doing a bike trip down the Romantic Road in Germany in a couple of weeks! Believe me I have been going through all your posts again for must see sites to see. Thank you so much for your fabulous posts from Germany. Summer plans include summer school for me this year, but I plan make time for scrapbooking! How fun!! No big plans for summer - but we do have lots of little weekends away on the schedule.